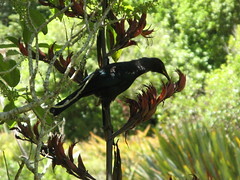 Bird life at the Korokoro Dam. I’ve walked from Petone to Porirua a couple of times now, and both times I’ve gotten lost on a farm on the Porirua side and ended up walking down some random farmer’s driveway. This time I thought I might do it in the other direction, so that maybe I could finally figure out where I should have been going. Location: Belmont Regional Park, Cannons Creek Lake Reserve to Cornish Street. 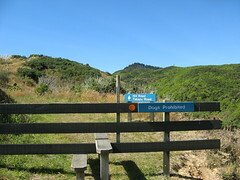 Intended route: Start at Cannons Creek, walk up past Cannons Head and Belmont Trig, then down one of the routes near the Korokoro Stream, and out at the Cornish Street exit in Petone. Belmont Regional Park is one of my favourite places to go walking near Wellington. It’s very accessible for public transport, and it has a nice mixture of native bush, as well as open areas, albeit mostly farmland, from where there are some nice views. The park is owned by the Wellington Regional Council, which recently completed purchasing all of the remaining farmland, but still leases it out to be used as farms at the moment (as I understand it, at least). 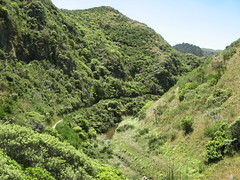 Most of the farmed area is on the western and northern side of the park, whereas the native bush tends to be on the Hutt side, particularly around the Korokoro stream. 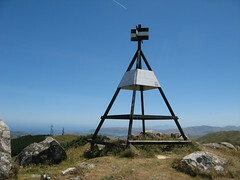 The high point of the park is Belmont Trig (at 457 metres), which has an excellent vantage point for a 360 degree panorama around the entire Wellington region through the Hutt, central Wellington, and out towards Porirua and Plimmerton. This time, I thought I might start at Porirua, and make my way back to Petone. Until now I’d always done this in the other direction, and ended up getting lost when trying to get out on the Porirua side, and finding my way out over farmland that I probably shouldn’t have been on ideally. Especially since I think I’m supposed to be coordinating a tramping club trip in the area a bit later this year, it seemed like a good idea to remind myself a bit about how long it’d take to get around the place. I got to Porirua Railway Station at about 9.20am, and from there it was about a 30 minute walk to the Cannons Creek Lake Reserve entrance, which is really well signposted, just past the Cannons Creek shops on Mungavin Avenue. This is the first time I’d been to the lake reserve, and I wasn’t 100% sure there would actually be a track of any sort out the back of it into the rest of the park. The lakes in the reserve are long and thin, and it’s possible to walk along either side of them. It turns out that both tracks converge at the end, and then it does carry on into a definite track into the rest of the park. 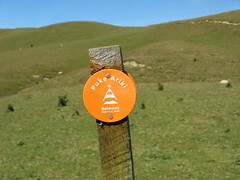 The first park-related sign from here points up the track to both Hill Road and Takapu Road, but it’s possible to get pretty much everywhere by following it. I left the end of the lakes at about 10.15am, but within a couple of minutes, the track split, with a sign pointing in one direction to Hill Road (which comes up from the Hutt side, but further north than I wanted to be), or Takapu Road (which comes into the park from the southern end of Tawa). I didn’t really want to go to either of these places, and as far as I could tell at the time, Belmont Trig was probably about half way between. In the end I pulled out my Wellington topo map and set a compass bearing, and decided that for the first 50 metres at least, the track that was signposted as leading to Takapu Road was going in a much more favourable direction. It turned out that this was the better way, but in hindsight I think I probably could have gone in either direction, although the Hill Road route would have meant a longer day. After 15 minutes I did actually get to Takapu Road, which I hadn’t realised (until now) was actually a road-end entrance into the park. At this point there was a sign clearly pointing to Cannons Head, which I recognised was a peak not far along the ridge from Belmont Trig, so that was very reassuring. The road from here basically went past the power sub-station, but it split immediately afterwards in a three-way intersection. There wasn’t any clear signage about where each road was going, and it looked as if all three directions had track marker poles. This was a bit confusing at first, so I just went with my gut feeling and followed the more straight-ahead route (to the left) which also looked as if it was heading more towards the centre of the regional park. This ended up being a good choice in the end, and 15 minutes further along the road, there was a sign pointing along a track up the hill to Round Knob (another one of the peaks along the same line as Belmont Peak and Cannons Head). First views of Wellington Harbour. The track up the hill continues squiggling around the high tension power cables, which is a common theme around this side of the park. 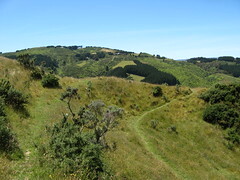 By 11.15am, I’d reached the intersection with the main Puke Ariki track, which runs along the top of the park, and turned south towards Cannons Head. Cannons Head was about 10 to 15 minutes away, and it’s the bit of track leading up to it which was the first decent view I had of Wellington Harbour on the far side of the park. The track then continues with some ups and downs and by 11.50am I was crossing the fence which (I think) divides the farm-land from everything else. From here, the track becomes slightly more overgrown with various grasses and more native plants, since I guess there aren’t as many sheep around to munch on it. After another 10 minutes of walking, I’d reached the intersection of several tracks just below Belmont Trig. There are at least three obvious ways down to Korokoro from the Trig and I hadn’t quite decided which route I wanted to take, but it’s only a 2 minute jaunt up to the top from there in any case, so I wandered up to the trig for a few minutes of looking at the surround scenery of the entire region. The most direct way down from the trig (I think) is to continue past it and hop over a gate on the southern side along the Ridge Track, which leads down the southern-side ridge past a place called Baked Beans Bend, before it joins the Korokoro stream. I’ve come up that way several times, so wasn’t too keen to go that way. Another track, which I’ve never followed, is called the Bridleway track (or something similar), and goes around the western side of the ridge. I think there’s another road-end or two down that way, but otherwise it follows a stream back towards the Korokoro Stream, before meeting up with the ridge track somewhere just after Baked Beans Bend. 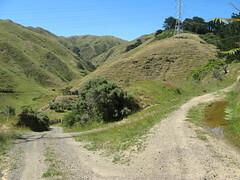 The third way is to turn east at Belmont Trig, and head straight to the Korokoro stream, then follow it (along a track) until it exits around Petone. This track isn’t actually signposted as such — instead, the sign points to Stratton Street, which is one of the roads on the Hutt side of the park. There are places to turn off before actually reaching the road, however. So I followed the sign pointing to Stratton Street, on the assumption that sooner or later I’d find some way to avoid actually reaching Stratton Street. 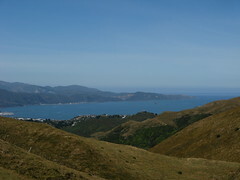 The weather was fantastic, and it was from about here on that I started to meet quite a few family groups wandering up towards the trig from the Hutt side of the park. At about 12.30pm, I reached the first obvious turn-off, which was signposted as pointing to Oakleigh Street. I didn’t exactly want to go there, either, but it looked as if it was heading in a better direction than the main track, so I followed it. There was an old possum-bait warning sign very shortly after that junction, and almost immediately the track veered up the hill. This didn’t seem quite right, and although the track was still obvious, it was now more of a trampled-grass track than anything else. I followed it up the hill for about 5 minutes before I decided I must be going the wrong way, and turned around, since it felt like it was almost heading back towards Belmont Ridge. Sure enough, as soon as I descended back down to the possum-bait sign, there was another track obviously visible that curved around the hillside lower down. It even had a track marker pole. 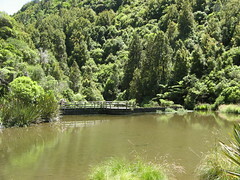 By 12.55pm, I’d left the farm land and was now walking through native bush near the beginning of the Korokoro stream. According to the signpost I’d seen earlier, this track was still heading towards a place called Oakleigh Street, but at least it was in the area where actually I wanted to be. At 1.10pm, I passed the Oakleigh Street track junction, which was very reassuring, since it meant that the track I was on would probably continue for the length of the stream. From here, the Korokoro Dam was about 10 minutes away, and on reaching it I sat down for another quick snack. It was pretty obvious by now that there wasn’t any hurry, so I stopped in a few places to listen to birds. This is quite a nice sign. The Korokoro Track is a very well maintained track (even though it’s thin in places), and there were lots of people out for an afternoon wander by now. By 1.35pm I reached the junction where the Ridge Track (and the Bridleway Track) converge onto the Korokoro Track, after coming down from Belmont Trig. 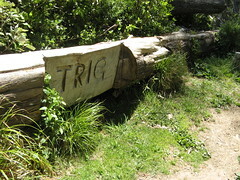 Someone’s very helpfully carved out the word “TRIG” in very large letters in a fallen tree, indicating a direction up that track, so it’s very easy to pick out. For the rest of the walk out to Korokoro, the track hovers above Korokoro stream as it winds its way through the valley out towards Cornish Street. I stopped in one place about half way along where I found a small side track that led up the hill, but apart from that I pretty much wandered straight out to Petone, since the trains were only running every hour on New Years Day. I reached the Cornish Street road-end at 2.10pm. As it turned out, it was a neat day with some really nice weather and almost no wind. 4 hours from one side of the park to the other was a little faster than I was expecting, but I did walk reasonably quickly in places and I’m sure that it can be stretched out much longer by walking further north towards the Pauatahanui direction. I’ve done this in the past, but not during a time when I was writing things up. This entry was posted in daywalk and tagged belmont regional park, daywalk, independent trip, wellington. Bookmark the permalink. Hi Sudhir. If you’re looking for people to get you aquainted with tramping and walking in NZ, I’d definitely suggest you check out a local tramping club. There are several in Wellington if that’s where you are. You can easily get onto trips with people (daywalks or overnight tramping). Come along to one of our meetings on Wednesday nights if you like. See this page for details.